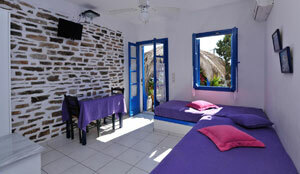 We will be happy to assist you to organize your arrival in Antiparos. If you let us know your flight details, we can book boat tickets for you from Piraeus to Paros. There is a frequent direct bus service from the Athens airport to Piraeus port (every 20 min) at a cost of 3 Euro per person. We can book a taxi to drive you from Athens airport to Piraeus port at a cost of 50 Euros. You can take the Blue Star ferry boat to Paros island, a 4-hour15min. trip, at a cost of 33 Euros per person or 29 Euros per person on the deck. From the port you can take the bus to Punta to Antiparos, the bus leaves from the port every hour and 10 min to Punta. There a small ferry boat will cross you to Antiparos port in 10 min. The bus will cost you 1,50 Euros per person. You can take the direct boat from Paros port to Antiparos port, at a cost of 4 Euros per person. The direct boat usually is waiting for the blue star ferry or the High speed boat. We can take a taxi or we can book one to wait you at Paros port to drive you to Punta to Antiparos, at a cost of 15 Euros. From Paros airport you can go to Punta to Antiparos only by taxi which we can book for you at a cost of 17 Euros. Οr you can book the taxi by your self . Tel. number of taxi driver 00306973434343 Mr Stavros. Every afternoon at 3,30pm a boat named Blue Star ferry leaves from Santorini to Paros port. A 3:hour trip, at a cost of 19 Euros per person or 16,50 Euros per person on the deck. 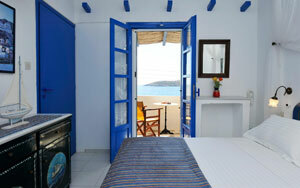 We can book a taxi for you at a cost of 2o Euros to drive you from Mykonos airport to the port. 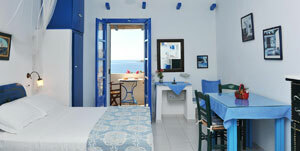 Daily, there are 3-4 boats from Mykonos to Paros island. A 1-1,30 hour trip.